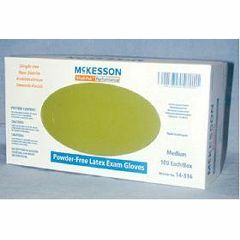 Non-sterile latex powder free exam gloves from McKesson Feature. Stronger than the average. Good Fit. Comfortable. These gloves are stronger than the average glove with the tips of the fingers even stronger yet. This glove slips on VERY well and is much stronger than the glove I was using. I use this for working on cars and in my woodshop. THAT needs a strong glove.